Sellers claimed the NASCAR Dodge Weekly Series Division I championship by recording the highest point total, based on his best 16 finishes of the year, in Division I. For this honor, Sellers will receive a $25,000 bonus from NASCAR and Dodge. Sellers’ point total (1,114) was also the highest among the four NDWS divisional champions, giving him the national crown and an additional $50,000 award – for a total of $75,000 in post-season prize money. who was honored in a similar affair in Nashville. Then-five-year-old Sellers attended the event and now, 17 years later, he takes center stage. “At an early age, when I started racing go karts, I remember going to Nashville,” Sellers said. “To come back as a champion feels pretty good. “Really, this was a breakout season for us. We won one 200-lapper last year. We got to the point where we could be a good top-five contender every week, everywhere we went. For whatever reason – my experience level, my ability to work with my crew chief, H.C., who is my brother – we just couldn’t put a lot of wins on the board. Sellers’ family-run team stuck with their program in 2005 and scored big under NASCAR’s new points format. Overall, Sellers recorded 15 wins and 20 top-five finishes in 28 races this season – including 12 wins at his home track in South Boston. His best 16 finishes netted him 1,114 points towards the Division I and national titles. Robert Powell in 1988. He is also the second Virginia driver to win the title in the past three years. Mark McFarland, a native of Winchester, Va. who is scheduled to race full-time in the NASCAR Busch Series in 2006, was the Commonwealth’s first national champion in 2003. The talented young star began his driving career at the age of seven, in go karts. By age 13, Sellers was racing in open wheel mini sprints and he moved up to Super Stocks, at South Boston, at age 15. By 2004, at the age of 20, Sellers had advanced to Late Model Stock Cars and had also made his debut in the Automobile Racing Club of America (ARCA) RE/MAX Series. 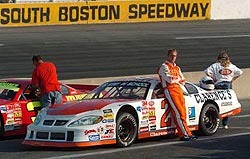 Sellers finished fifth in the track championship point standings at South Boston in 2004. This season, under NASCAR’s re-vamped format for the NASCAR Dodge Weekly Series, Sellers was able to branch out and compete at other tracks in Division I. Drivers could collect points towards their divisional title by racing at other tracks in their Division. Sellers’ occasional trips to Motor Mile Speedway, in Radford, Va., and Caraway Speedway, in Asheboro, N.C., helped him pad his points lead and win the title. In addition to his racing career, Sellers graduated from Danville Community College in 2004 and currently attends Averett University in Danville, where he studies business management. Sellers also works as a heavy equipment operator for his family’s business, Sellers Brothers Inc., and is an active member of the Ringgold Baptist Church. Peyton won his share of races in 2005 at South Boston (above) and a number of other tracks. At age 21, Peyton Sellers has achieved a major milestone in his auto racing career by winning one of NASCAR’s most prestigious annual titles. 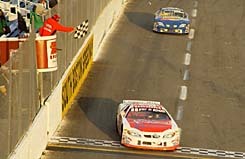 Sellers, of Danville, Va., won the 2005 NASCAR Dodge Weekly Series national championship after a winning season in Late Model Stock Cars at South Boston (Va.) Speedway and other area tracks.